Disney's Sleeping Beauty by Thomas Kinkade is featured on this crown-shaped Disney Sleeping Beauty Thomas Kinkade Hanging Acrylic Print. 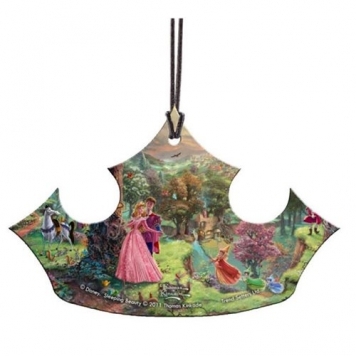 Aurora and Prince Phillip, along with other beloved Sleeping Beauty characters, are surrounded by color and light instantly recognizable as the work of Thomas Kinkade. The image is made entirely of acrylic, and the translucent properties of the decoration allow natural light to illuminate the vivid colors and details. Measuring approximately 3 4/5-inches wide x 2 2/5-inches tall, it's perfect for your tree or anywhere in your home. or even your car! Hanging string included. 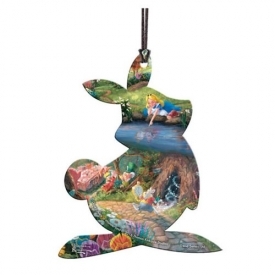 Trend Setters Ltd. creates images that are actually made of acrylic! 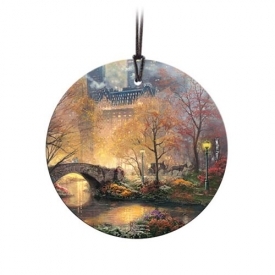 Designs and images are fused into extraordinarily durable acrylic decorations that you can hang on your tree or any wall. With vibrant colors and vivid details, they're scratch and fade resistant, and they look great in windows or cars, due to their light-catching properties and the fact that the image is viewable from both the front and back.